As an avid outdoorsman Frederic Lyman loves finding new activities to do for all types of weather including the winter season. No matter what the weather may be; cold, hot, cloudy, sunny, rainy, snowy, etc. there is always something to do that involves appreciating nature and the outdoors. While he may prefer soaking up the sun in Hawaii Frederic Lyman still finds great enjoyment in the many different winter activities he has discovered over the years. 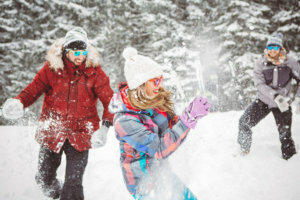 Check out some of his favorite outdoor winter activities below and be sure to connect on social media to share your favorites with Frederic Lyman! Overnight, or during the day, an inch of snow will fall to the ground. Yes, there is the shoveling of it from the driveway and sidewalk, but then that snow can be formed into awesome shapes! Stack up some snow and dress it up with a scarf, hat, buttons, branches, and that carrot nose to make a cool snowman or stack up a bunch of smaller snowballs to start a snowball fight. It’s fun to have these snowball fights – just don’t throw one point blank because it can hurt someone. Otherwise, have a ball (pun intended, sorry). Find a big hill clear of trees that’s safe to climb up and slide down on a sled. That’s always fun for kids and adults too and can even be a great form of exercise running up the hill again and again. It’s not just for the figure skaters that dance to classical pieces, get awarded for their performance, and take the gold medal in the Olympics. If you’re good with balance like riding a bike, then it should be easy to tie up the laces, get on the ice, and calmly glide around the rink. For those looking for a little more action, there is always ice hockey. Get a group of friends together to play on the lake, after ensuring it is frozen and safe, or check your local ice skating rink to find pick up games or even leagues to get involved in. Skiing is a great way to get out and enjoy nature with friends and family. Everyone can learn to ski with a little practice and in the end it is an awesome activity that can also provide great exercise. When you are checking out those awesome views from the top of the mountain, you aren’t even thinking about the cold! While not for everyone, winter camping can be a lot of fun. Just be sure to obtain the necessary equipment including proper tenting, a warm sleeping bag, materials to build a fire, and plenty of clothing. Winter camping can be quite an adventure but also can be dangerous if not done correctly. Be sure to do your research and really, dress warm!